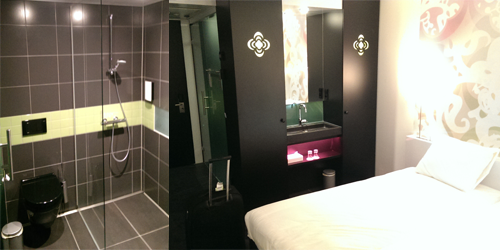 One more thing was missing from my post-series about my trip to the Netherlands: some words about the hotel I stayed at while I was there (well apart from Tulip Inn in Eindhoven). 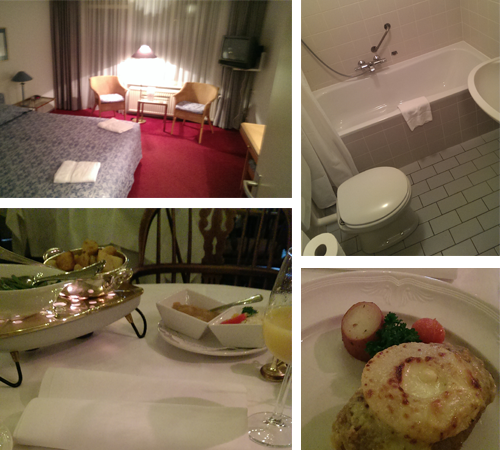 I was advised to stay at a place, not far from the location I had to visit, called Hotel Bakker. It is a quiet little hotel in Vorden, a small city in the south-east of the Netherlands. For me it was the first time I was in a “non-commercial”, local hotel in the Netherlands, so it was an interesting experience for me. I was actually surprised, that everyone spoke well English, but then again, I was in the Netherlands… who doesn’t speak English there? 🙂 . Anyway, the place was OK for the price they charged for a room. It was not as fancy as the life-savior hotel in Eindhoven, but it was clean, it had free WiFi and it had a very friendly scenery: the rooms were all on the ground floor, with a back door to a common grassy area, there were small ponds with rocky edges all offering a relaxing and calm atmosphere to chill down a bit after a busy day working. On top of that, I ate dinner almost every evening at the hotel. The food was… well, I think this is what fine dining in the Netherlands means: a quantity of nicely prepared meal which you can actually eat in one go 🙂 (usually it is quite hard to eat up everything when one eats normal food). The good part is: I was always a bit hungry by the time I got back to the hotel, so the quantity and the quality of the food was just perfect ;). 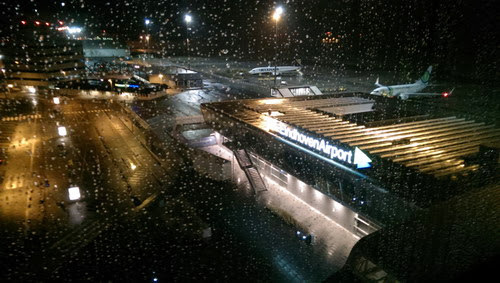 After a troublesome evening, but great night at the Eindhoven Airport hotel, the next day I was ready to pick-up my car that I reserved at one of the rental companies. This time almost everything went smoothly and I was on the highway to my destination in no time. I wrote almost, because there was still an issue with the car rental: they do no accept VISA Electron cards. The truth is, I have never tried to book a car using that card, but after using it everywhere when I had to travel (in Europe and in the U.S.) it did not even cross my mind, that they may not accept it. Anyway, when I showed them a MasterCard they were more than happy (although there were no big differences, because both are debit cards and both have chips integrated…). Anyway, this was a lesson that I quickly learned and used all the time while I was in the Netherlands: they like MasterCards more than VISA Electrons, so be prepared 😉 . 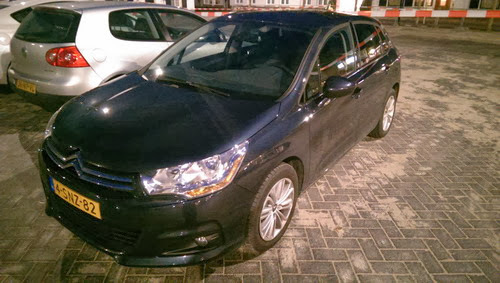 Maybe a few words about the car I was driving: a Citroen C4. I must say I was a bit worried about the usability of the controls, because, we have to admit, we are talking about an artistic little French piece of equipment here… To my surprise everything was in order (just like a VW or any other car I am used to), with just a touch of French art (just enough 🙂 ). Another great surprise was the built in GPS (although it took a while until I switched it to speak in English 🙂 ) which helped a lot during my quest to find my destination among the potato fields 😛 . The car looked and felt great… until the moment people started to pass me by real easily… Yes, yes it was an economy car I know, but still… why won’t it accelerate?? Bottom line, no matter how fancy equipment it has, I would not trade my 11 year old car for it. Period. Update: The invoice arrived after a few days. Everything was OK. They have won back a few points… 😉 . It has been a while since I have written my last post. It was a busy week, so I really did not find any time to finish my entry-series for the Netherlands. Yes, there is one more post, but this time it is not Amsterdam, it is the Dutch capital: Den Haag. As I have already mentioned in one one of my older posts, the train ticket to Den Haag Centraal from Amsterdam Sloterdijk station was only €11.20, having bought a Dagretour(“Day-return”) ticket, meaning that we returned to the source station on the same day. After a short travel by train (45 minutes), we arrived on a quite cloudy day to Den Haag. From there we headed to the nearest information point, which was actually almost in the city center. Actually there are very few information points, compared to Amsterdam: the first sign showing us, that this city is quite different. On the day we arrived there was a great parade for veterans, so the city was really in motion (and we could easily get information&directions from the coordinators of the parade). After Madurodam we went out to the sea-side, on tram No. 1 to De Pier. The beach is very nice, it was a great feeling to be on a long, sandy beach after the rocks of Liguria 🙂 … too bad it was cloudy and as we got out, it started to get even foggy. We sat down to a beach-club (open-space) enjoyed a pint of beer and happily concluded that people did not get scared of the not-so-good weather, they rather stayed and enjoyed the beach as much as they could. Next stop, back to Den Haag city center. 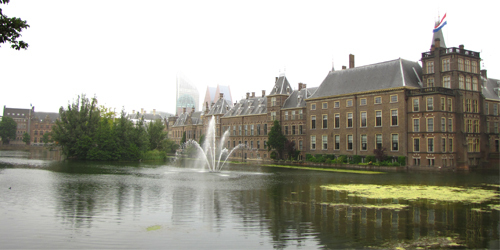 We visited the Dutch Parliament buildings Het Binnenhof, a lovely building from the outside, too bad we couldn’t get in… 🙁 . Anyway it was a nice place to just take a walk at. The lake near it was really beautiful. So much for Den Haag, and our trip to the Netherlands. I can only advise everyone to visit at least once in their life these lovely places from the “lot-to-do-and-see” city, Amsterdam, to the tranquil and calm Den Haag. There are pictures of Den Haag on my Picasa account. 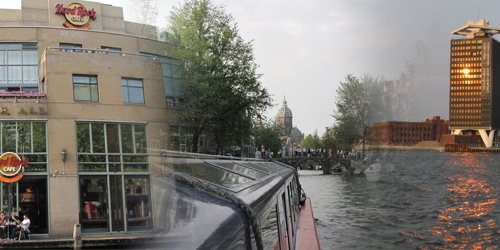 Our 3rd day in Amsterdam was filled with plans to visit some of the more exciting places in the city. We woke up quite late (compared to how much we wanted to see), and headed out to the city center, The Dam Square. Here our first stop was Madame Tussauds, the Amsterdam version of the famous wax-museum. At the entrance we found out, that we could purchase a common ticket with The Amsterdam Dungeon for €37.50. Well, we said well’ give it a try. After the little ride in history we got up to a nice, quiet place, with an abundance of very famous persons’ wax figures. From here on it is all the excitement we had. Some of the figures were quite realistic, some… well some a bit not too good. At the exit we could buy our Obama photos I think for €8.00, but I am not sure of that. 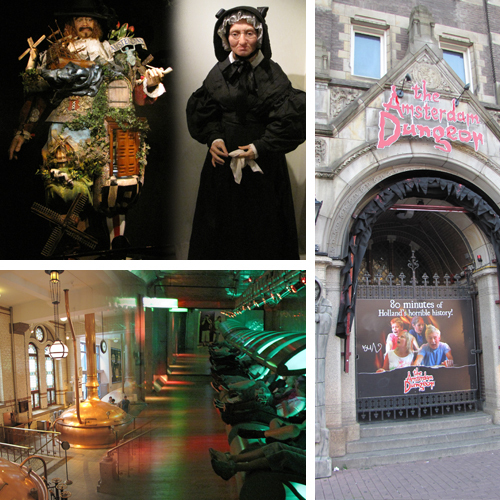 From Madame Tussauds, it was a short walk on the Rokin street, to get to The Amsterdam Dungeon. At the entrance some strange figures awaited us, very friendly I must say. A guy was standing there for example welcoming people, asking where they were from, and even learning some words of their language. As soon as enough people gathered (8-10), we were granted the entrance into the dungeon (No photos allowed). The whole ride is made up of a series of visits from one room to the other, each one having a theme. Along the way different actors guide you through, making the experience as realistic as possible. It was great, but for some reason, I think the Madame Tussauds adventure, we were not really scared this time 🙂 . There were two photo opportunities, (we could buy the photos at the exit): one at the entrance, and one in the mini-roller-coaster (that is quite interesting, too 🙂 ) (We payed for the 4 photos, a reduce price of €25.00). Next stop was our visit to the Heineken Experience, which is not far away from the city center, really close actually to Museumplein. For this we have bought the tickets online for €15.00, so we could skip the line (it was actually not a long one). We were taken through the history of Heineken Breweries, and had the chance to experience first hand some of the tasks of beer brewing. We even got the chance to taste an initial juice made from squashing the grain (quite sweet). Then we went up a level, where there was a special room, to experience what it feels like to be a beer being brewed (quite funny). At the labeling section we had the chance to make our own customized label on one of the Heineken beers for €5.00 using credit cards (we could pick them up at the exit). A few rooms showing the later success story of Heineken followed including a larger room with the “Heineken Sport Experience” (I liked this). All in all it was great it was worth the money: especially because it had 3 beers included 😀 . Photos are allowed everywhere, with virtually no restrictions. During our very busy morning and afternoon, we didn’t realize how much time has passed, and how hungry we got. We headed out for some great (not too healthy) meal… but where? Well, let’s try Hard Rock Cafe. It is a quite nice place located on the banks of one of the canals a little to the north from the Rijksmuseum. The experience was quite good, we ate a lot, we got filled up. Oh yes: our waitress was a very friendly polish girl, with whom we did chat along a bit, and found out some details about the city’s life 🙂 . So, I think this post concludes our visit to Amsterdam. A lot has been done, it was a very nice experience, and I’d recommend it to everyone, it is one of the best cities I have visited! Thanks again for our host, who let us stay in her apartment in this period 😀 . Photos here. P.S. Red Light District? Well, don’t be so curious 😛 .